It's Sunday, 8:46 PM when a craving for a little something sweet suddenly hits me like a ten ton truck. Normally this is not an issue, but with the painful Arctic temps Chicago has been experiencing I am in full hibernation mode...i.e., NO GROCERIES. I feverishly scour the cabinets to see what ingredients I have on hand and find an unopened container of Scharffen Berger cocoa powder...SCORE! After a quick search on the Internet, I ran across this recipe. Sweet tooth crisis averted. In a medium heatproof bowl, add the butter and set on top of a large sauce pan with barely simmering water. Melt the butter, then add sugar and salt, and stir until well combined. Next add the cocoa powder and stir until mixture is smooth and hot enough that you want to remove your finger fairly quickly after dipping it in to test. Remove the bowl from the skillet and set aside briefly until the mixture is only warm, not hot. 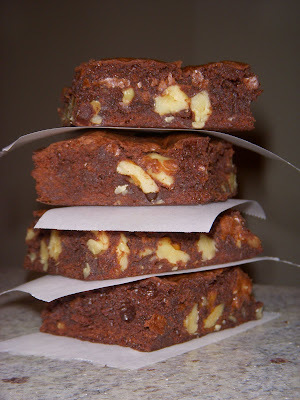 This recipe makes what I call the perfect brownie - a chewy (not cakey) middle with a thin crust. Great brownie. When in doubt, use cocoa powder. Great advise, Dawn! The only thing missing is the tall glass of ice cold milk to go along with them!